Giselle "Gigi" Barrington is quite an unusual young lady for her time. She travels around Europe as her father's companion, taking her to many places and meeting many people that she normally wouldn't meet. Whilst he collects fairy tales and folk stories, and acts as a British spy, she collects the recipes from the places they visit with the hope of eventually being able collate them into a book. Not only does she like to collect the recipes, she also likes to cook them herself - very unusual behaviour for a young lady of her class. Whilst in Stockholm, Giselle's father is handed a very important document to take back to England that will change the course of history dramatically. When he is murdered for that document, Giselle knows that the killer will soon be after her too. She doesn't know who the murderer is, but she could identify him from a distance, but she knows that she needs to get away as it is very likely that he knows who she is. Where does a young woman who is alone go to hide in a foreign country though? Then again, the same problem faces her in England as well. She can't go to her family home, as that would be the most obvious place for the killer to look for her. There is only one person that she can go to, which is her family friend Georges Bisset, a chef in the Duke of Whittaker's house. He is able to recommend her for a position as cook in the house of Lord Aldridge. No one would think of looking for a young lady in the kitchens of a nobleman's kitchen and this position has the added bonus of being quite close to her own home so Giselle can see if anything is happening there. 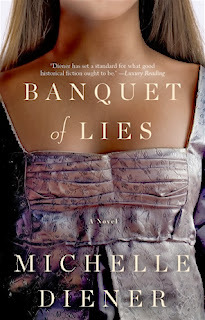 Whilst whipping up fantastic dinners, Gigi gets a glimpse into the lives the servants live as well, battles against the butler who clearly dislikes her, find herself on the wrong side of the law and so much more. She knows that she is still a target for the assassin so she needs to work out who the person is who should have received the dangerous missive, get it to them and stay alive! Lord Aldridge is a former soldier who gained a taste for continental food during his years serving his country. A younger son who inherited a title, Aldridge fills his day managing his estates, attending parliament and involving himself every now and again in some intrigue for his country. He can't quite understand why his cook has him all twisted up. His reaction to her is incredibly strong which is difficult for him as he is a fundamentally good man who has never engaged in trysts with his staff and he doesn't intend to start now. If only he could stay away from her. Over the last 12 months or so I have been fortunate to read three of Michelle Diener's books and each one of them has been a delight! This book, which was recently released was the third, and once again I was treated to a fun story with good characters that is an easy book to read and get lost in. The reader is treated to a mix of romance, history, mystery and adventure that the author balances really well. It is worth mentioning that the characters from The Emperor's Conspiracy do make an appearance in this book. I am a stickler for reading in order and as such get really upset if I don't know this kind of thing in advance. Having said that, you could easily read this book first without missing out on too much. Hopefully you would be intrigued enough to go back and read their story if you hadn't previously read it. I am already hoping that Michelle's next book will feature these same sets of characters. The Duke of Whittaker in particular seems to be an ideal candidate to have his story told, particularly if it means that he gets to meet an unusual woman to shake up his life. I should mention the food too. Oh my goodness, the food in this book sounds so good! I was left salivating as Gigi served up course after course of delicious sounding food. On her website, Diener has shared a number of recipes that were mentioned in this book, and I have to say...I would be happy for her to come and cook for me anytime! LONDON, 1812: Giselle Barrington is living a double life, juggling the duties of chef with those of spy catcher. She must identify her father’s savage killer before the shadowy man finds her and uncovers the explosive political document her father entrusted to her safekeeping. Posing as a French cook in the home of Lord Aldridge, Giselle is surrounded by unlikely allies and vicious enemies. In the streets where she once walked freely among polite society, she now hides in plain sight, learning the hard lessons of class distinction and negotiating the delicate balance between servant and master. Lord Aldridge’s insatiable curiosity about his mysterious new chef blurs the line between civic duty and outright desire. Carefully watching Giselle’s every move, he undertakes a mission to figure out who she really is—and, in the process, plunges her straight into the heart of danger when her only hope for survival is to remain invisible.